In the early 1980s, the US Army developed a requirement for a new multi-purpose vehicle to provide greater capabilities to the warfighter while simplifying the support requirements needed to keep the existing fleet of vehicles operating. At this point in time, the Army was still using the M151 Mutt, M561 Gamma Goat, M718 and M792 ambulances, and a number of commercial vehicles (CUCV) to fulfill its various missions. A common chassis and powerplant would significantly simplify the training and number of parts it took to keep these vehicles operational. So started the High Mobility Multi-purpose Wheeled Vehicle (HMMWV) program. AM General won the program and has produced over 190,000 vehicles in over 16 variants since the mid-1980s. Early versions of the Humvee were powered by 6.2 liter diesel engines while newer types received the 6.5 liter diesel. All Humvees are equipped with automatic transmissions to simplify driver workload. 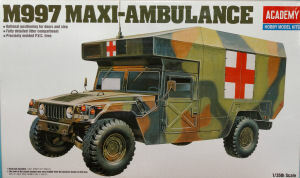 The M997 is dubbed 'maxi-ambulance' as it has a larger armored shelter for evacuating wounded personnel. The M996 is the 'mini-ambulance' variant with a smaller shelter. 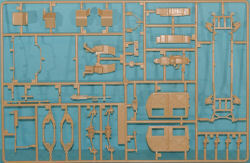 Both versions are based upon the M998 chassis. 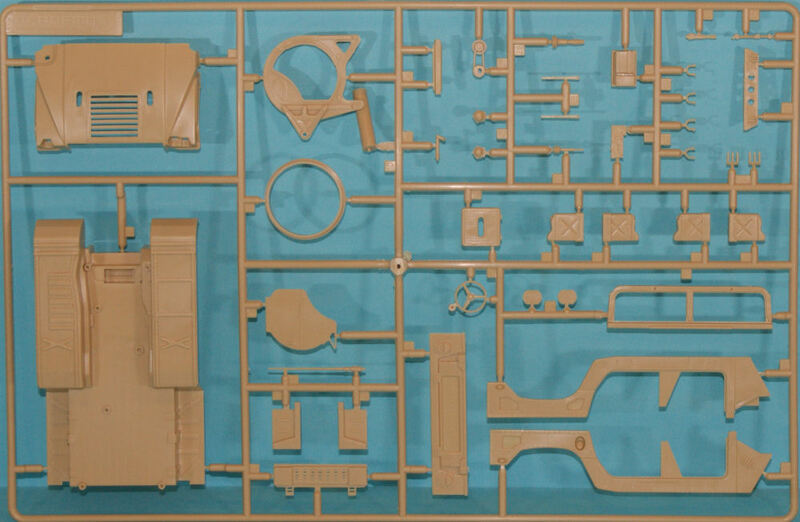 Academy released their first Humvee kit a number of years ago and had produced the best kit of these AM General vehicles, beating out the Italeri and the Tamiya re-boxing of the Italeri kit as well as a few other attempts from other manufacturers. 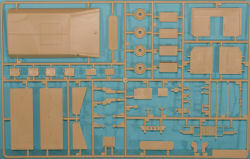 More recently, Tamiya released a new-tool Humvee kit (there are now two variants available) and detail-wise, their kit now beats the Academy kit in detail (simply through improved molding technology as well as better detail information that has become more readily available since the release of the first kits from Academy and Italeri. 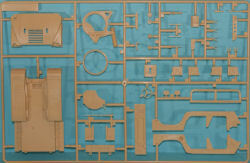 Nevertheless, with an MSRP of over $10.00 more than the Academy kits, Tamiya's details come at a premium. 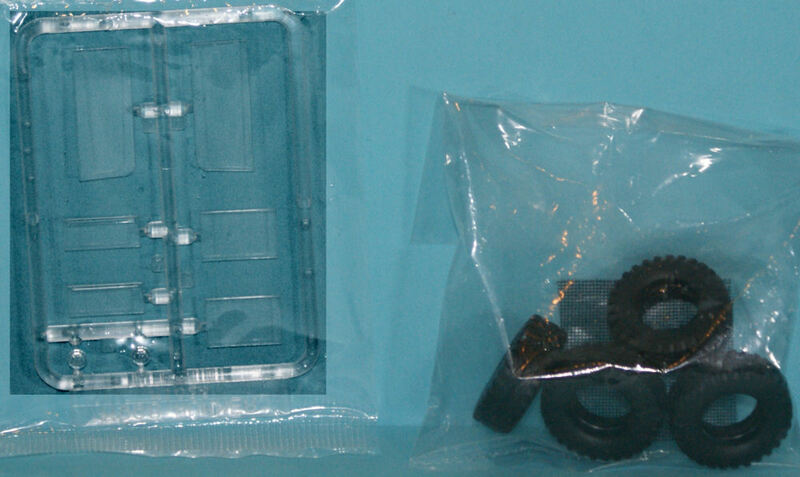 With no real glaring errors in Academy's kits, remain a better value for many modelers. Academy has issued several new variants of the Humvee to reflect some of the combat configurations of the vehicle and these have been accompanied by their other existing Humvee offerings. 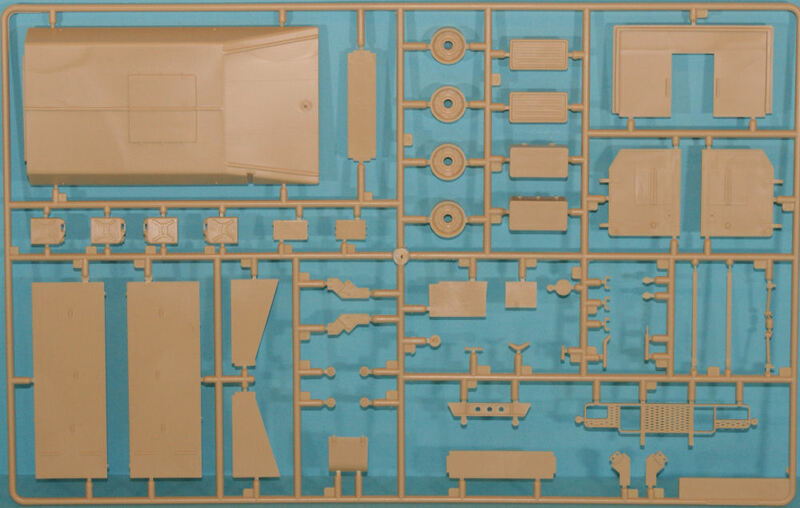 One such offering that has been available for a while is the M997 Ambulance, which still remains the only styrene version of this vehicle available in this scale. 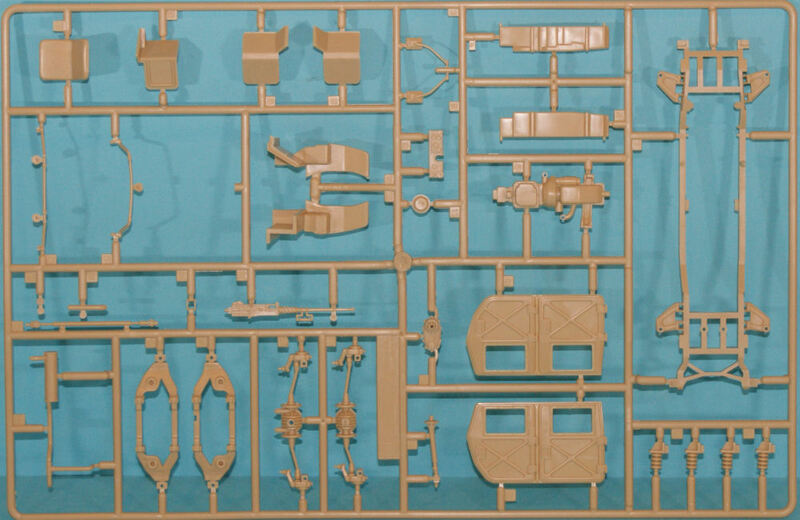 Molded in tan styrene, the M997 kit is presented on four parts trees, plus a single tree of clear parts and a set of rubber (vinyl) tires. 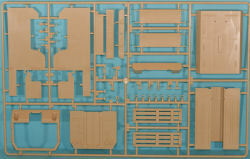 Those of you familiar with this kit series will recognize two of the parts trees (and the clear parts) are from the standard M998 kit, but there are two additional trees that are focused on the unique armored shelter for the ambulance. One of the unique capabilities of the Humvee is its modularity and adaptability to different missions. In this case, the rollover bar, tailgate, rear side doors and rear seats are removed to accommodate the shelter box that sits in the rear of the vehicle and the overhang of this shelter also provides a protective cover for the driver's compartment. Other versions of this shelter-carrying capability include different configurations of S250 shelter that drop into the same spot. The cab interior is common with the standard Humvee kit and includes a radio set (though better sets are now available in the aftermarket domain). The shelter has a nice interior with the storage compartments, cab access door, litter racks, and two litters included. The rear doors of the ambulance shelter are positionable as are the cab doors. 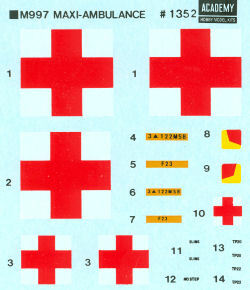 Decals are provided for a generic ambulance. 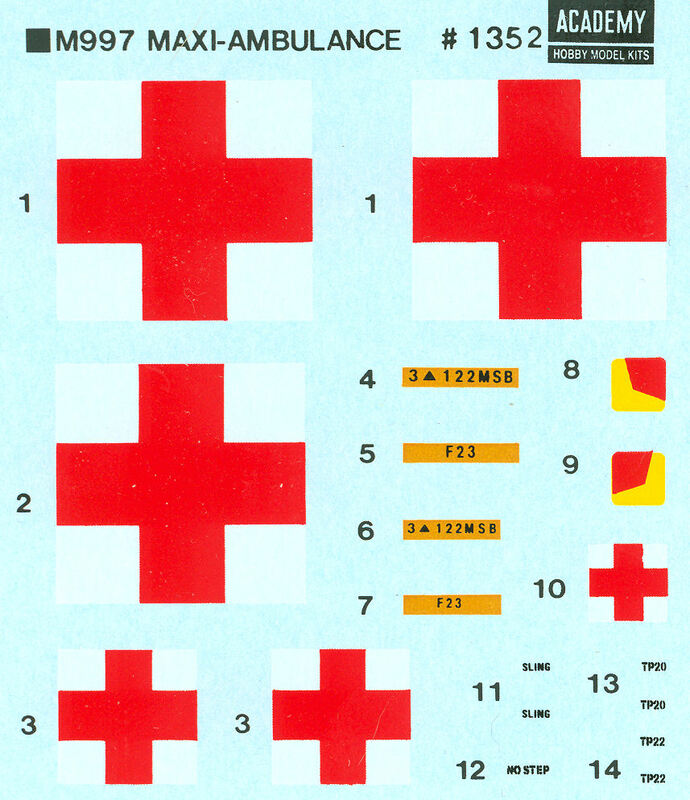 You can search online for any distinctive markings you might want to replicate for your maxi-ambulance. While this kit may be based on an older release, this model has withstood the test of time nicely. 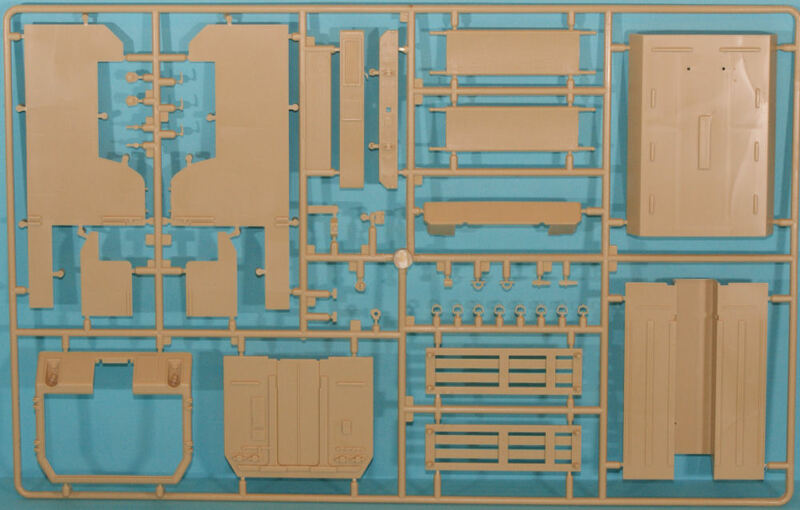 If you want to add a little more detail to the model, Eduard produced a set of photo-etch for this kit, and the real hard-core Humvee modelers could put the Academy shelter on the Tamiya chassis and have even more options. In any case, I'm looking forward to producing a number of Humvee variants, not the least of which include this ambulance and the distinctive Raytheon HUMRAAM - a Humvee with a four-rail AMRAAM launcher.